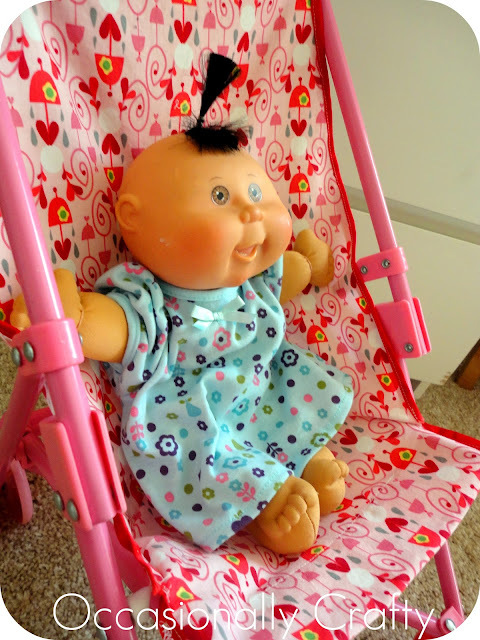 Do you have one of those inexpensive, fold-up doll strollers? Did your kids wear through the fabric as quick as mine did? All three of my kids have used and loved our doll stroller, and it has been through several makeovers. Making a new stroller seat is easier than you think it would be. Here's the old one in all its glory. I know it only cost about $10, but you'd think they could make the fabric just a LITTLE more sturdy, considering it is small children who will be playing with it! 1. I used a seam ripper to separate my pieces, because I was worried I would screw something up if I didn't use the exact same-size pieces. 2. I didn't have any bias tape, and wasn't in the mood to go buy some, so I used ribbon folded in half to sew around the rough edges. It worked fine, but you have to be really careful to catch all the layers when you sew. 3. I didn't create a buckle because, frankly, my kids can never open those things and are constantly yelling "Mom, come open this buckle for me!" I'm really tired of it. Vixen's stroller was just like a built-in fabric buckle, but I didn't even do that. Simplicity, folks. That's how I roll. 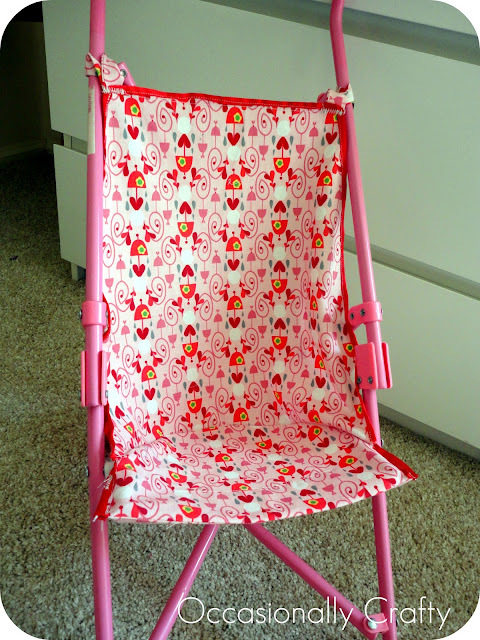 Now little Ellie has a place to sit (instead of being dragged with her dress hanging from one of the handles)! 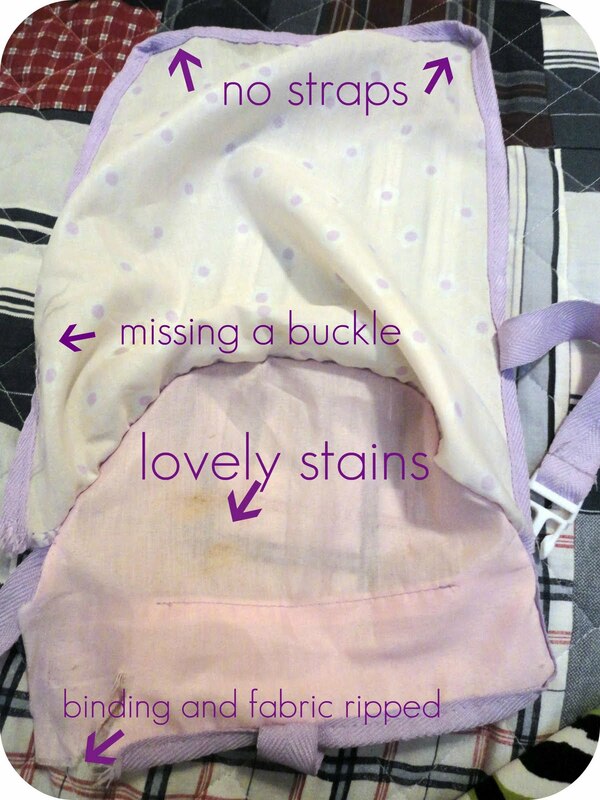 I'd say this is a pretty easy project, so if your doll stroller has seen better days, give it a try! Linking up to party this week- come check them out with me! Ahhh - so cool! Love that idea. Thanks for sharing! My girl's strollers have the exact same problem. Love it! And your fabric is the cutest!! Aww that came out adorable! And I definitely know what you mean! I only have one girl and we are on our third one! Of course my kiddos push each other around in it! lol! Thanks for linking to Sew Crafty Saturday !